Perhaps due to thier friendship with the cricket loving Grace family, the Ellacombes became very important in the formation of the Bitton Cricket Club, founded in 1851, which soon became an integral part of the parish life. An 1864 team versus Knowle, in a double innings match, read : Parker, C Bush, Sealy, Kemp, Alexander, Cater, Godfrey, W Sommerville, H Bush, Eyles and J Sommerville. Next season with many of the same players Bitton won a home game versus Two Mile Hill. 1884 saw one of many annual club dinners held at The White Hart Bitton, with dinner provided by Mr and Mrs Gibbs, and medals presented to E Cater and S Lovell. During this year Bitton played 23, won 13, lost 5 and drew 5. Fifty members,two years later, sat at tables which were “of a most inviting appearance” at the White Hart. Mr W Sommerville joined Mr J T Howes in toasts to ‘All Denominations, the Patron, the Club and its Officers’. All toasts were then celebrated by “musical honours” supplied by Messrs. Taylor, Creese, Cater, Knight and Torrance with Mr Nicholas on piano. A final toast “The Old England Defender” was given to Colour Sergeant Ollis of The North Somerset Volunteers. The 1898 dinner chaired by Dr Vernon once again contained toasts to many subjects other than cricket. The Army, Navy and the increase of military numbers from 70,000 to 236,000. “Hear,Hear” with applause for the financial status of the club and prospects of a new ground; songs and a recital by Dr Vernon. June 1877 Bath Association v Bitton. The home team 59 for no loss, Bitton all out 11. 1919 ,Schoolmasters “A” v Bitton – H Short bowled Timmings for 9. May 1920 Thornbury v Bitton at the Ship Field Alveston, H Short caught and bowled E M Grace. 1885 venue Bitton – Home team 289 for 6 v Bath Association. Mr H G Gallop 134 not out. It was also rumoured that W G Grace played in this game. 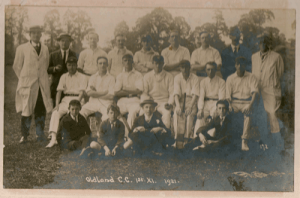 Oldland Common School 1905 was the venue for the club dinner. A duet of Mr F Lear on piano and Mr F A Williams opened the programme. Songs including “Annie Laurie” and “The Old Grey Box” were sung by P Isaacs and J A Taylor followed by musical sketches by F A Wiltshire. The highlight of the evening a sixteen colour sketch in four minutes. H G Gallop celebrated forty years as club captain in 1922. He was presented with a time piece and during his speech recalled playing with both W G and E M Grace. Presentation bats from Stothert & Pitt were awarded to Mr Parsons and Mr Prouse. The club facilities were used for The Tariff Reform discussions in 1910 and in a cross ideas debate a gentleman was asked to give Bitton Cricket Club £10 to back his belief, his counterpart of opposite opinion would do the same. After a short break the option was turned down and the amount reduced to £1. June 1922 Wells Asylum X1 V Bitton – at stumps up the home team 142, Bitton 116 for 7 – F Prouse 22, E Adams 10. The team also included three members of the Gallop family. The Reverend Taylor did not bat. J S Fry & Sons 128 v Bitton 154 for 4 at the County Ground April 1919 . For Bitton, G Parsons not out 63, E F Adams not out 61. A local newspaper reported the 1864 game Bitton v Hanham, at the Bitton ground . The two innnings game saw Bitton win by ten runs. The team included three members of the Bush family. The match report shared the July newspaper page with among other items an advert for MAISH’S LIVER PILLS, a naval battle of American ships off Bull Rock on the Irish coast and the American Invasion of Maryland by Confederate forces. Two games during 1875 season : Bitton 137 v Cleeve Hill 57. R G Sommerville 29 and bowler Martin took 6 wickets. This May game was followed in June with a win for Bitton against Chewton Keynsham, Bitton winning by 14 runs – A K Butterfield 25 runs and 6wkts. The team included G Spare and J C Randolphs. 1926 records a win against Bristol Saracens with H Short taking five wickets for four runs in only two overs and three balls. The same August newspaper reported Jack Dempsey had been refused a license to fight Gene Tunney at The Yankee Stadium New York. 1928 records a 71 win over Coalpit Heath; C Gerrish 52 not out. From its formation untill 1896 the Bitton Club played their home games at The Meadows , near St Marys Church, then taking the pavillion with it, the club moved to land rented from a Mr Vowles near the Rising Sun public house and eventually in 1920 to the existing Recreation Ground, provided by Mr Charles King-Smith, the clubs Vice President. The cost of preparation of the playing pitch was donated by Mr J Torrance, and the first game played at the new ground in 1921. The early days of the Rec were shared with the Tennis Club and followed by The Football Club in 1923. Dr Edward Mills Grace- Bitton Club member and brother of W G Grace. Canon H N Ellacombe – One of the club founders .Pesident 1863 and 1897-1918. The Sommerville family- W, J, F, A A and W Jnr. The Bush Family – C, H, J N and S.
Harry Short – long serving club member, Captain 1924. J R Torrance – Club Captain 1907-1910. J H Taylor – President 1919-1924. C P Sommerville – Captain 1900 and Chairman 1903. E Adams – Secretary 1920-1922 (Mr Adams took over from a Mr Denham who left the club for Australia under dubious circumstances).